We present a multi-site stochastic model for the generation of average daily temperature, which includes a flexible parametric distribution and a multivariate autoregressive process. Different versions of this model are applied to a set of 26 stations located in Switzerland. 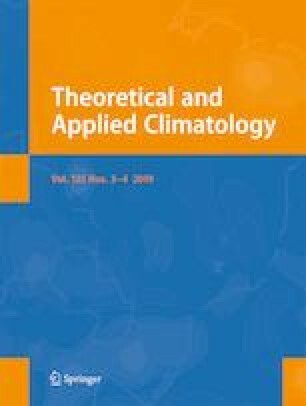 The importance of specific statistical characteristics of the model (seasonality, marginal distributions of standardized temperature, spatial and temporal dependence) is discussed. In particular, the proposed marginal distribution is shown to improve the reproduction of extreme temperatures (minima and maxima). We also demonstrate that the frequency and duration of cold spells and heat waves are dramatically underestimated when the autocorrelation of temperature is not taken into account in the model. An adequate representation of these characteristics can be crucial depending on the field of application, and we discuss potential implications in different contexts (agriculture, forestry, hydrology, human health). Financial support for this study by the Swiss Federal Office for Environment (FOEN), the Swiss Federal Nuclear Safety Inspectorate (ENSI), the Federal Office for Civil Protection (FOCP), and the Federal Office of Meteorology and Climatology, MeteoSwiss, through the project EXAR (“Evaluation of extreme Flooding Events within the Aare-Rhine hydrological system in Switzerland”), is gratefully acknowledged.